Rendering of 2.0 University Place at 41st Street and Powelton Avenue. Philadelphia-based co-working network Benjamin's Desk announced Wednesday that it will soon open a fourth location in Powelton Village, adding to its portfolio of local offices in Rittenhouse Square, Washington Square and at the nearly completed Pennovation Center. 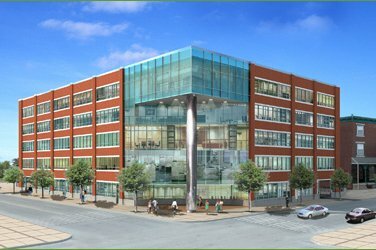 At a ceremony celebrating the completion of renovations at The Curtis Center, Benjamin's Desk CEO Anthony Maher said the company will be leasing shared office and event space on the top floor of 2.0 University Place, located at the intersection of 41st Street and Powelton Avenue. Benjamin’s Desk Chief Design Officer Adam Glaser will lead renovations at the 12,380-square-foot facility, with construction support coming from property manager Newmark Grubb Knight Frank. Flexible work options, an environmentally friendly design and member access to a rooftop lounge will be among the amenities of the new location. While Maher did not reveal a definite opening date, he said private office space is expected to be ready for founding members by the fourth quarter of 2016. Separately, Benjamin's Desk announced that it will expand its Rittenhouse Square offices to the historic Sun Oil building at 1608 Walnut Street. Owned and leased by PMC Property Group, the 19-story Art Deco high-rise dates back to 1925 and was listed on the National Register of Historic Places in 1983. Construction and renovations, led by Glaser and Brass Castle Partners, will create an additional 11,693 square feet for private offices, shared desks and meeting rooms. "We’re more than doubling down on our presence at the heart of Center City and opening up even more space for members to incubate their ideas and build lasting relationships," Maher said. Benjamin's Desk, founded in 2010, offers affordable, flexible and scalable membership options to support businesses as they grow. Note: PhillyVoice.com is a Benjamin's Desk tenant.